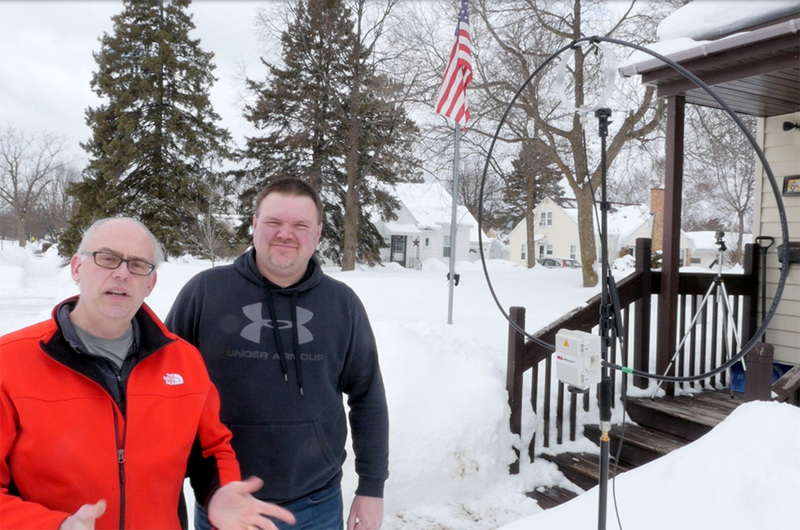 Well today I’m with Joe KD9CGX and we’re setting up the Chameleon P-Loop 2.0 Mag-Loop Antenna, It’s a little bit warmer today than it was for our last– Well, 35 degrees warmer than the last video. Yeah, but we got about five feet of more snow than we did last time, so if it’s not one thing it’s the other. But today we’ve got the Chameleon P-Loop 2.0 and we’re gonna use it today, for the Wisconsin QSO Party, a state-wide operating event, so hopefully we can make some great contacts with this fascinating antenna. But first, Joe’s gonna take it away and tell us a little bit more about the antenna and how it works, and then we’ll finish up with our impressions of it. Well, band conditions were a little bit less than stellar this week, so, really had a difficult time trying to demonstrate the antenna, especially in the midst of our retesting period, a giant solar flare erupted just totally obliterating the 20 meter band, so hopefully from this review you can kinda get a really good idea of how the Chameleon P-Loop sort of operates, sets up, and functions, in a variety of situations. 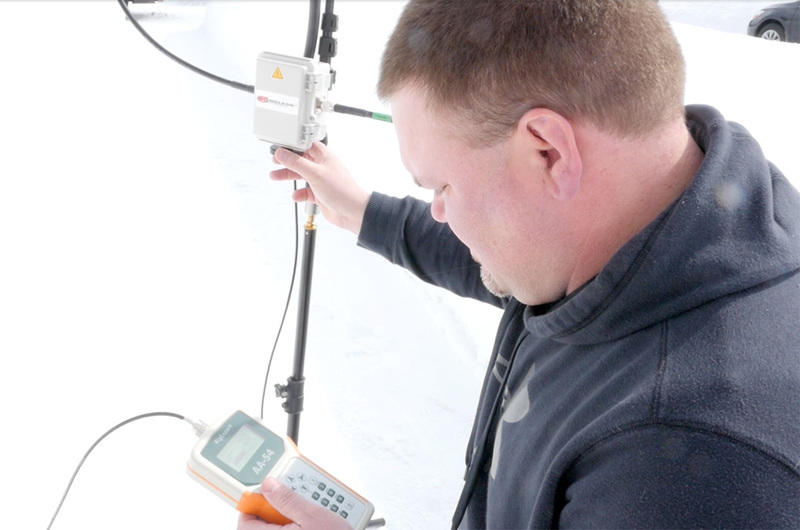 You gotta understand the Chameleon P-Loop 2.0 is made for portable operations, so, folks that run around full power, this is not an antenna for you. You gotta understand what the expectations are. 25 Watts take it out into the woods, take it out camping, it’s very easy to set up, comes in this nice canvas bag actually. It is very efficient in terms of power use, you make the most of that 25 Watts. You’re not gonna find that in just trying to throw a dipole up in the air, throwing a dipole up in the air while being portable, is kinda sort of haphazard. Sometimes you get lucky, sometimes it’s more NVIS than anything else, whereas if you wanna work DX, this portable loop you don’t have to get it up off the ground more than what the tripod does. So in that essence, out of five stars I’d give it four or four and a half. Very quality build. One thing we have noticed it’s very touchy with tuning. So if you can bring a analyzer, or even an SWR meter, that’s gonna be your friend in tuning this is that literally touching that knob at the bottom is all it takes to bring it between, you know, 1.5 SWR and infinity. So that’s the only other really thing I’d say about that. I think the construction’s great. It’s very, very rugged, when we were testing it at the Wisconsin QSO Party we’re having wind gusts of 30 miles an hour, and it fell over at least two or three times– – And nothing ever happened. I guess if you ever had a problem where the coax was damaged, you can just replace the coax. You can also contact Chameleon, they do make replacements, I do know Chameleon also makes a little bit of a larger loop. A little bit of a larger loop will give you a little bit more of a bandpass. But the essence is it’s gonna be a bigger antenna, so you kinda, it, and what we’ve noticed, especially in the high winds, it does get top-heavy. The only other thing I can recommend is in a situation like this, maybe a sandbag, something else to keep it tied down. Finally, we know the deals with the homeowner’s association, and not being able to put up with anything, this is really that stealth antenna you can put it out on the patio, have your fun on a Saturday afternoon, bring it back in, and the neighbors can’t complain about it. – Quick set up, quick tear down, perfect for HOA’s restricted environments, apartments, Great for if you wanna go out to the park, and do something, like a POTA or SOTA activation, take it camping. POTA would be great, I think if you were up on a mountaintop, or hilltop, with this thing running CW, all day. You could run all day, you make all the contacts you ever wanted. Thanks a lot Joe for bringing the antenna, and giving us a chance to test it out. Do you have any questions or comments; experiences with the Chameleon P-Loop 2.0? Please leave them in the comments below.